• Высококачественное многослойное просветляющее покрытие для линз, позволяющее увеличить световые характеристики прицела и улучшить качество изображения. Successive push of a button selects one of the three available reticle shapes: dot, horizontal lines and lower vertical line (without central dot), and combination of these two variants. The reticle colour is red, it features brightness control. Blinking reticle indicates that the battery should be replaced soon. 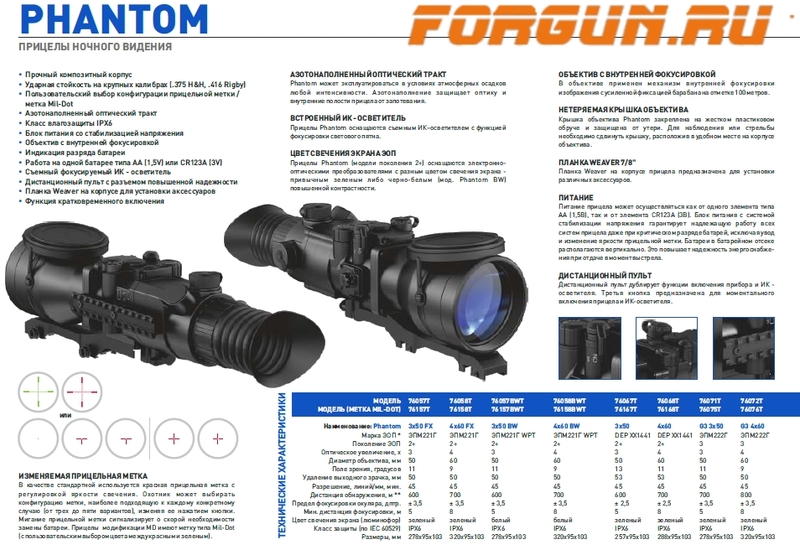 The objective lens uses internal image focusing, with the focus knob locked at 100 m.
This riflescope operates only when the fast start-up button is kept pressed. It’s very convenient when you do not conduct permanent observation and need only a quick assessment of the situation. The Phantom is suitable for operation in heavy precipitation conditions. The nitrogen purged design prevents the lenses and inner surfaces from condensation. The Phantom has an option of a powerful removable IR illuminator offering a variable beam from spot to flood. The Weaver 7/8" rail on the left side of the body designed for mounting additional accessories. The riflescope can be powered both with a single AA (1.5V) or CR123A (3V) battery. 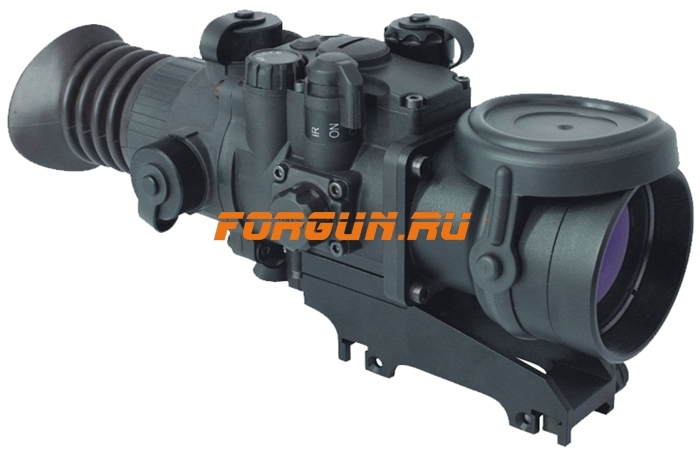 The voltage stabilisation system eliminates reticle shift and drop in reticle brightness; guarantees proper operation of the tube and IR-illuminator, even with an almost discharged battery. The batteries are positioned vertically, which enhances reliability of energy supply during recoil. The attachable remote control duplicates the “ON/OFF” function and IR Illuminator. 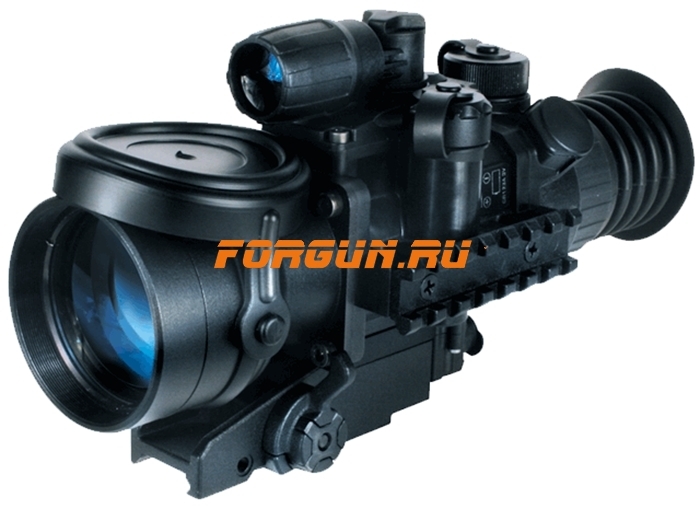 The third button switches on the riflescope and IR Illuminator instantly. The following mounts are available: Weaver, Weaver-Long, Weaver-Auto, Side Mount, Los, Euro Prism, MAK adapter.